The gritty and relatable short "Trophy Boy" explores the devastation that can come from leading a double life: one you portray online, and one you actually live. "Trophy Boy," the debut project of NYC’s EmCo Entertainment (emcoentertainment.com) screened as part of the Cannes Short Film Corner at the Palais on May 18, 2018. This short marks the directorial debut of British actor / director and creator of "Trophy Boy" Emrhys Cooper (‘Person of Interest’ / ’Mamma Mia’). Cooper portrays the leading role of James, a self-proclaimed influencer who “has it all:” looks, charm, followers, likes - you know, the important things in life. The film, written by Anthony Johnston (‘After Louie’ / ’Revenge of the Popinjay’), is a haunting exposé of the dark side, and the repercussions of, the millennials social media obsession. Further, it unveils the duality of who we really are versus who we portray ourselves to be on the internet. It is a riches-to-rags unraveling, showing the dangers of linking your self-worth to Facebook likes. 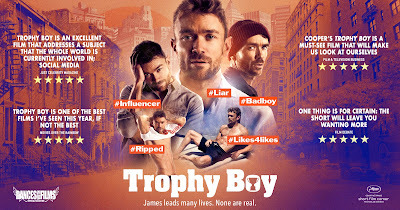 "Trophy Boy’s" commendatory first reactions have prompted discussions of turning the short into a TV series which is currently being developed by EmCo Entertainment. One thing is for certain: the short will leave you wanting more. It prompts the audience to either question their own social media fixation or reach for their mobile to take their next hit of digital ego-inflation. Cooper can be seen next starring in the sci-fi thriller "Altered Perception" in theaters May 4, followed by the remake of "Nosferatu" alongside "The Shape of Waters" Doug Jones.